I was asked if I thought that including interactivity in a mathematics was important. The answer to me is most definitively YES! In fact, I believe that if your mathematics and science classrooms do not include at least some of the features that I will describe below then you are doing a great disservice to your students. It may not be possible to include all of these examples in every context, but at least some of them are crucial to a deep understanding of mathematics and a recognition of its importance in our lives. When I attended high school in the early 90s, every graph I had to produce I did by hand. 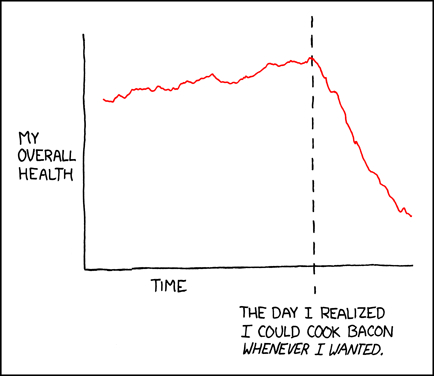 As a result my graphs looked something the following. Now the problem with this of course is that if I want to modify the graph above and compare my modification against my old graph, I need to redraw the entire graph from scratch every single time. While there is some merit in learning the skill of creating a crisp neat graph, it is difficult to progress to more advanced graphing concepts when it takes you 15 minutes a graph to produce something worth reading. Imagine the situation today where I can produce a graph immediately and then modify it, add an extra graph to compare two graphs, save my graph to look at later, etc… This is what modern graphing software allows us to do. This kind of interactivity allows students to look at much deeper concepts involved with graphing and of functions. Look at this example graph. Imagine you are working on learning how to find the equation of a line from the graph. Which would you rather do; a worksheet with 20 different graphs on it, or would you rather look at a picture like the one below and find 20 lines first, and then find their equations. At least one of these examples involves recognizing that the lines come from nature. What if you are looking at the properties of quadratic functions? Do you want to stare at a bunch of graphs of quadratic functions, or do you want to look at video footage you created yourself? Here’s what that looks like. Now the students can collect data about the graph, learn about the relationship between thrown objects in our world and parabolas, and then finally they can analyze their data and come to a conclusion about the motion of thrown objects. Here’s what that kind of video looks like (this was video collected from a webcam, transparent graph paper over-laid on top of the video and the entire clip slowed down; all in iMovie). Want students to create their own trigonometry word problems for practice? Maybe you’ve recognized that the best way to understand the formatting of a word problem is to create one for yourself. Instead of having students write out a word problem on paper, look at what happens when you have them create a story-line and video tape themselves performing their word problem. In probability class you have them running simulations with dice (or even better playing a game involving dice). In calculus, have them compare the instantaneous speed versus the average speed as a homework assignment when they take a drive with their parents. In statistics class have them gather data from their peers and do the statistical analysis of information gathered from class. In geometry, have them prove the Pythagorean theorem by measuring out giant right triangles on a soccer field and compare the known length of the hypotenuse (which they measure) to the expected hypotenuse (which they calculate using the Pythagorean theorem). Use the last idea and talk about experimental error. There are lots of other types of interactivity in the mathematics classroom that I haven’t shown here. Interactivity doesn’t have to include the use of technology, but at the very least you should have your students doing something each class, rather than sitting there and being passive recipients of the information.